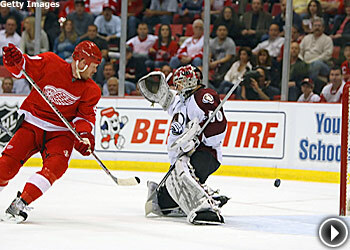 Fantastic Franzen – The Detroit Red Wings have so many stars it's easy to overlook a player like Johan Franzen. But not any more. Franzen was among the NHL's hottest goal-scorers down the stretch, and added the overtime winner in Game 5 of the opening round against Nashville. He had the first two-goal playoff game of his career Thursday night and added an assist as Detroit held off Colorado, 4-3, in Game 1 of their Western Conference Semifinal series. Franzen got one goal on a deflection and another on a slap shot from the top of the right circle. He and linemates Valtteri Filppula and Mikael Samuelsson earned praise from coach Mike Babcock. The Wings already are “really good” – they didn't win the Presidents' Trophy by accident. Having a second line that can produce like that just makes things tougher for anyone hoping to beat them. No more old days – Detroit and Colorado used to be the NHL's hottest rivalry. They met five times from 1996-2002, and the level of intensity was incredible. But a six-year break – and the normal roster turnover that goes on over a span like that – has quieted things down a lot. The buzz at Joe Louis Arena on Thursday was nothing like the electricity that crackled through the crowd during the peak of the rivalry – and Wings goalie Chris Osgood, who was there for it all, hopes those memories stay in the past. Getting the “breaks” – The Montreal Canadiens got some breaks – including a controversial goal that survived a video review – in their 4-3 overtime win against the Philadelphia Flyers. But the best “break” might have been the one that turned Philadelphia center Jeff Carter's stick into kindling. 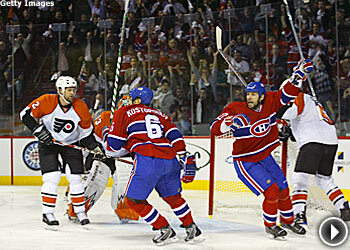 Carter and Montreal's Saku Koivu faced off with just over 30 seconds to play, the Canadiens on a power play and the Flyers leading 3-2. Carter's stick almost exploded, and Koivu got the puck to Alex Kovalev for a wrist shot that went past Martin Biron to tie the game with 28.6 seconds remaining. One to remember – Montreal's Tom Kostopoulos is in the playoffs for the first time in his six NHL seasons. Thursday night is one he'll always remember. The 29-year-old checking forward scored the first playoff overtime goal of his career when he banged his own rebound past Martin Biron 48 seconds into OT to give the Canadiens the win. Biron stopped Andrei Markov's point shot and Kostopoulos' rebound try, but the puck came right back to Kostopoulos, who put his second shot into the net. The Canadiens have gotten surprising production from Kostopoulos and linemates Bryan Smolinski and Steve Begin in the playoffs.